This book was written by Dave Molyneux and Matthew Richardson. It goes from his childhood right up to the present day. 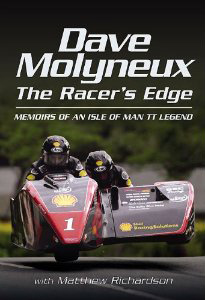 It is an auto-biography of the greatest TT sidecar racer of all time. Dave has won 14 TTs and he is equal third with Mike Hailwood in the total number of races won. Surprisingly Dave has never owned a road bike nor has he ever passed a motorcycle test. The TT races were first run in 1907 and the TT mountain course is the oldest motorcycle racing circuit in the world still in use. Motorcycles and sidecars first competed at the TT from 1922 until 1929, when they stopped racing because of pressure from manufacturers, who felt that sidecar racing was not helping the image of sidecars as a reliable and safe means of family transport. Sidecars were reintroduced to the race in 1955 and continue to this day. Dave is quite outspoken and there are some humorous sections in the book. One that I particularly liked was when he tells of the time that he was invited to a Honda riders’ special dinner. About 40 riders attended, and Dave was seated next to Joey Dunlop. Joey turned to Dave and said that he reckoned that Dave was crazy in the way that he rode his outfit. Coming from Joey Dave felt that this was a compliment! The Isle of Man Steam Packet Company held a survey about which TT races were the most popular – the Senior TT came first and the sidecar races came second. Dave is worried about the dwindling number of outfits making their way to the island. Cost is part of the problem. He feels that a possible way to reduce the cost would be to use standard engines. He explains that an engine taken from a solo has to power an outfit. It obviously has a lot more work to do – there is the additional weight of the chair plus two riders. Another factor is that the engine on the outfit is worked harder, because it is flat out for roughly 70% of the race, whilst the solo bikes are flat out for only 35% of the circuit. This is a really great book and would make a good stocking filler. It was first published in 2011 by Pen & Sword Books Limited. They have a good website at www.pen-and-sword.co.uk Once you are in this website, go to Wharncliffe Transport and you will see that they are doing the book as a special for £15.99 at the moment. PS News just in; Amazon are currently doing it for £13.99 with free P&P.